Whilst planning content for 2016 over the last couple of weeks, I’ve decided to relaunch my Flowerona Tips blog posts, as many of you have told me how useful you’ve found them. They’ll now be appearing here on Flowerona every Tuesday. And here’s the first one, where I’m going to share with you how you can direct traffic to your website or blog via Instagram. There’s only one place in Instagram where you can put a clickable link. And that’s in your Profile. When you first set up your account, it’s important to make sure that the link is to your website. But, have you ever thought about changing the link, now and again? For example, when you’ve written a new blog post. You could put an image from it on Instagram, change the link in your Profile to the blog post URL and then mention in the caption that there’s a direct link. In Image #1, I’ve put the URL to my Flowerona blog post in my Profile. In Image #2, I’ve included the text ‘Direct link to blog post in profile’ in the caption. Alternatively, if you’re running an event, like a course or workshop, post an image in Instagram and then change the link to the URL where your followers can book a place online. Look up the URL that you want to link to and copy it. Go to Instagram and press ‘Edit Profile’. Press in the website field (it’s the third one down from the top) and delete the existing URL. Paste in the new URL. Make it easy for your readers to find and read your content and they’re more likely to hop over to your website or blog. Just remember to change the link back to your website URL, when you’re finished. 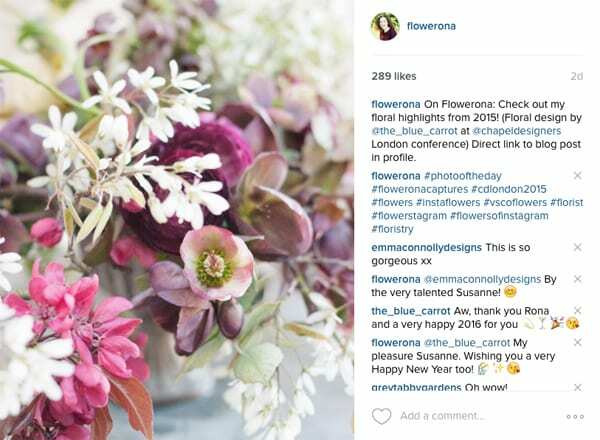 National UK Blog Awards...Flowerona has been short-listed! Hi Rona: I tried your tip re posting a link to my blog post from Instagram but it didn’t work. That said, I’m not sure I really understand the instructions. (It seems my brain can only handle the most superficial of techno tips.) 🙂 Should my followers be able to tap on my Instagram image and be linked to my website blog post? Thanks for your help.